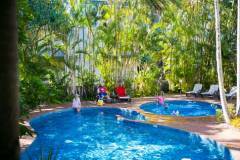 Ocean Breeze Resort on Noosa's Hastings Street is a prime location from which to take in the best that Noosa has to offer. The property is located right next door to 2 legendary Noosa hot spots where it is essential to be seen - the up-market, award winning Berado's Restaurant and CafÃ© Le Monde, where you can sit for hours and watch a steady stream of visitors wandering along Noosa's most famous street. An early morning dip at Noosa's main beach directly opposite the resort is a perfect way to start the day or for total privacy enjoy the seclusion of the resorts spa and swimming pool.